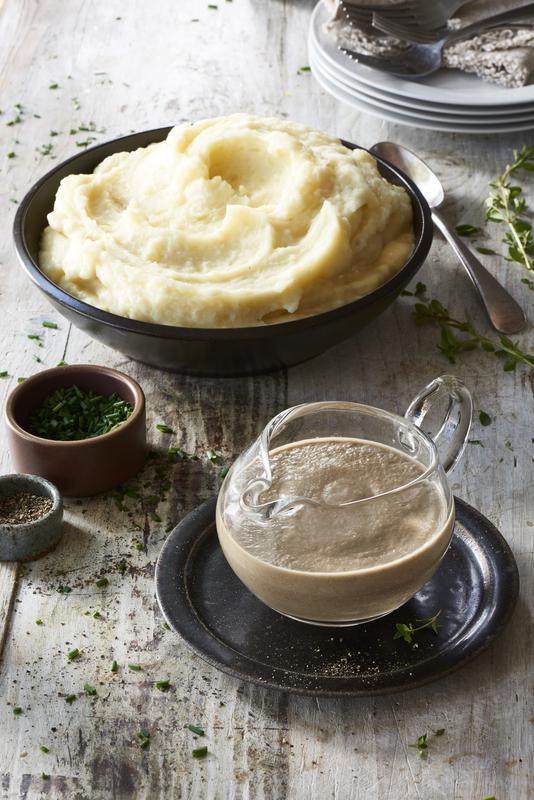 This one is nice and simple; just sauté some onions and garlic with some mushrooms, tamari, rosemary, and black pepper, blend with Massel veggie broth, and you’ve got a gourmet vegan gravy in less than 10 minutes. In a large skillet over medium heat, sauté 1 tablespoon of the olive oil, with the onions, thyme, and garlic for about 5 minutes until soft and translucent. Add the mushrooms, the remaining tablespoon of olive oil, the tamari, and black pepper, and sauté for about 10 minutes, until reduced and cooked through. Allow to cool slightly. Transfer the vegetable mixture to your blender, add the broth, and blast on high for 30 to 60 seconds until smooth and creamy. Season with salt and pepper, to taste. Transfer to a small pot, and gently warm on low heat to serve.